Abdon and Heath Parish consists of: Abdon, Balaam's Heath, Baucott, Brookhampton, Heath, Holdgate and Tugford. Balaam's Heath - a small hamlet. Baucott - a small hamlet. Baucot was held by Shrewsbury Abbey until the dissolution of the monasteries (1536-1541). There was a chapel here in 1138. Brookhampton - a small hamlet. Heath is a small hamlet. Heath Chapel is a Norman Grade 1 Listed building. It has remained substantially unaltered in use, status, size and style since it was built in the middle of the 12th century. There is a 'Lost village' lying in the field called 'Moat Meadow' behind Heath Chapel which includes many house platforms and a net of sunken roadways, together with the village well. Holdgate is a small village. Also known as Holgate, Helgots, Castle Holegod, Stanton Holdgate. 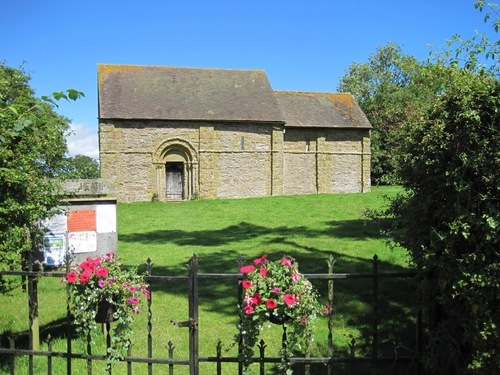 Holy Trinity Church, Holdgate - The church has Saxon foundations, but the present building dates from the Norman period. The western tower was added in the 13th century and restored in 1894. Holdgate Castle - The name Holdgate is taken from its Norman Lord Helgot who owned the village in 1086 along with 17 other parishes in Shropshire. Herbert, son of Helgot, gave the church and tithes to Shrewsbury Abbey around 1115. Regular fairs and markets here were features of a thriving community. Holdgate Castle, was built before Domesday by Helgot. There are remains of a circular motte inside the west quarter of what was probably a circular bailey, immediately north east of the church. Helgot died in 1087 and passed it to his son Herbert Fitz Helgot, who entertained Henry I here in 1109. It passed to Herbert's son Herbert de Castello, then to Robert de la Mere, and around 1216 to the Mauduits. Around 1258 it was alienated to Richard Earl of Cornwall who granted it to the Knight Templars. In 1272 it passed to Richard's brother Edmund, and was purchased as a ruin in 1284 by Bishop Burnell to whom the tower is attributed. In 1292 the 'Old Castle' was 'of no value'. In 1495 it was retained by the Crown until granted by Henry VIII to Thomas Duke of Norfolk. He exchanged it with Sir John Dudley in 1543 and around 1551 it passed to the Cressets. During the Civil War the site was apparently fortified, for in 1644 it was besieged and heavily damaged by the Royalists and a 'Brick Tower' is mentioned at this time. The remains were used to build a farmhouse into which the tower was incorporated, and now forms part of the present farmhouse. Sources: Castles of Shropshire by Michael Jackson 1988, Parish Documents held at Shropshire Archives, Shropshire Magazine November 1965 'Lost Villages in South Shropshire'. Tugford is a small hamlet. St. Catherine Church, Tugford - There was a chapel here as early as 1138. The Nave of the present church was probably built before this, and the chancel around 50 years afterwards. Only one Norman window remains. Tugford was held in early Norman times by Warin the Sheriff, who gave 2.5 hides to Shrewsbury Abbey. The lost village of 'Little Tugford' was last heard of in the 15th century.